This is a sponsored post written by me on behalf of Green Dot. All opinions are 100% mine. 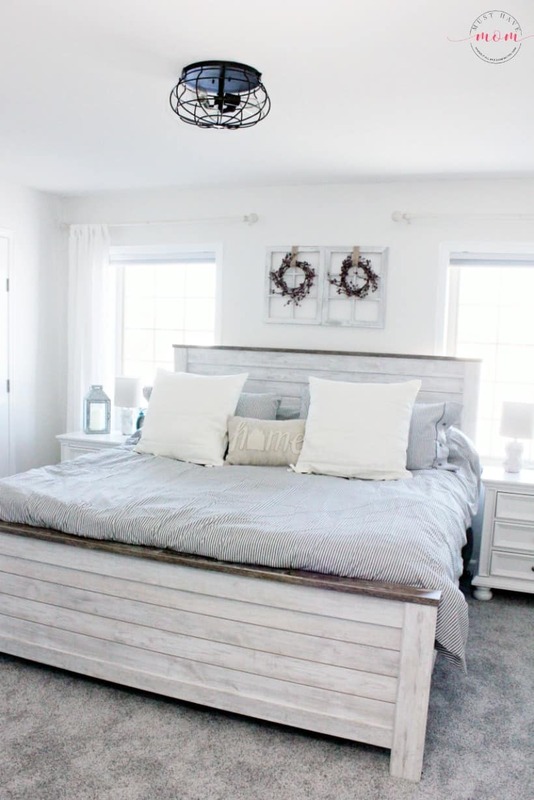 How do you do a farmhouse style makeover and stay on budget? 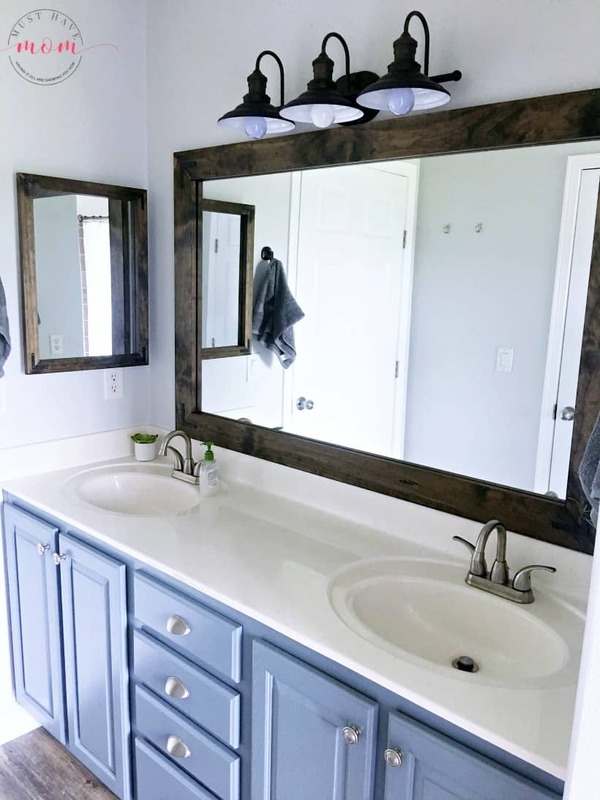 I have some tried and true tips to help you stay on track and still get that gorgeous Fixer Upper inspired look that you are going for. This year I have shared some of my favorite farmhouse style projects with you. I LOVE Farmhouse style decor. My goal is to transform every single room in our home into a beautiful, farmhouse style room. It all started with a few small outdoor farmhouse style furniture pieces. From there it moved into the master bathroom and then the master bedroom. Now the living room is my current project. If you aren’t familiar with the raging trend that has taken the country by storm, let me fill you in! Farmhouse style is decor that is rustic and simplistic while being gorgeous and warm. This style uses a lot of natural textiles such as linen, cotton and galvanized metal, while also incorporating rustic elements such as chicken wire and reclaimed barn wood. What Does Farmhouse Style Look Like? I am always on the lookout for key pieces that will fit into my farmhouse style vision without breaking the bank. These farmhouse style DIY Curtains are the perfect addition to my living room without costing a lot (just $5!). As you can imagine, redecorating an entire house can add up really quickly if you don’t watch your spending. I also try and shop on a budget and get things as inexpensively as possible and have managed to transform some rooms for a lot less than you might guess. But that doesn’t mean that I don’t have to watch every penny I spend. I could easily spend thousands of dollars on all the things I see that I love. 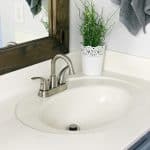 I once saw an amazing white farmhouse sink that I would have loved to have put in my kitchen. The almost $2,000 price tag made me realize that maybe I could live without the sink. Instead, I look at antique stores, estate sales, and thrift stores for less expensive finds that offer the same look of high ticket items. By shopping around and not just picking up the first high ticket item you see at that farmhouse specialty store, you can save a ton of money. I find a lot of unique wood pieces at random furniture stores like Ashley Furniture and Furniture Mart. You’d be surprised at how inexpensive some of their pieces are. 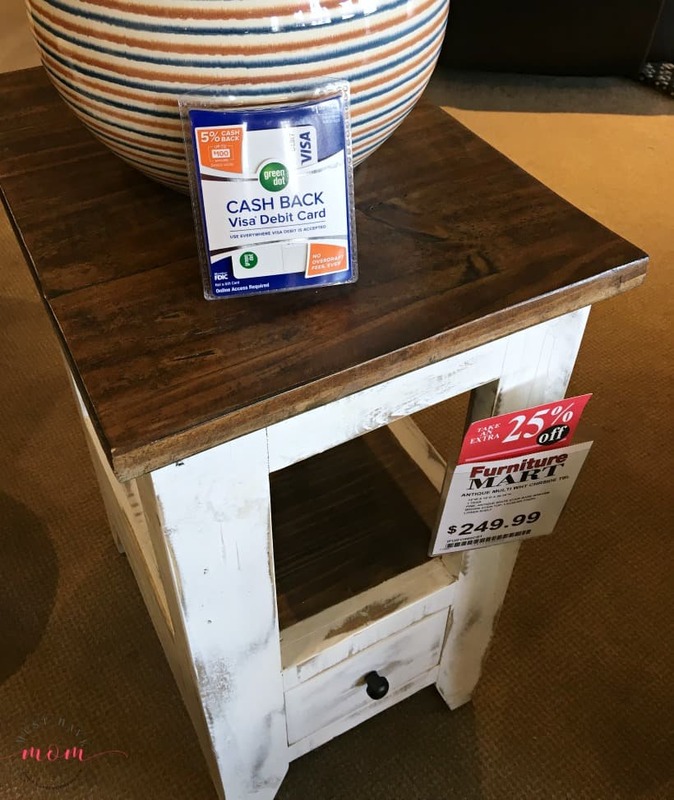 The end table above is from Furniture Mart and I bought two with my Green Dot card for my farmhouse style living room makeover. This is where the Green Dot Bank Cash Back Visa Debit Card comes in really handy. I can put a set amount on the card and I use that for all my farmhouse decor purchases. This ensures that I am not going to spend more than I have on my card. It removes the temptation for impulse purchases by giving me a set budget every month. But that is not the only reason I love the Green Dot Debit Card. Besides keeping me on a budget, this debit card has no overdraft fees or bounced check fees*, ever! So even if I do go a dollar or two over, my Green Dot card will not hit me with fees. There is also no minimum balance requirements. So, I can spend and reload as much as I want without being hit by hidden fees. 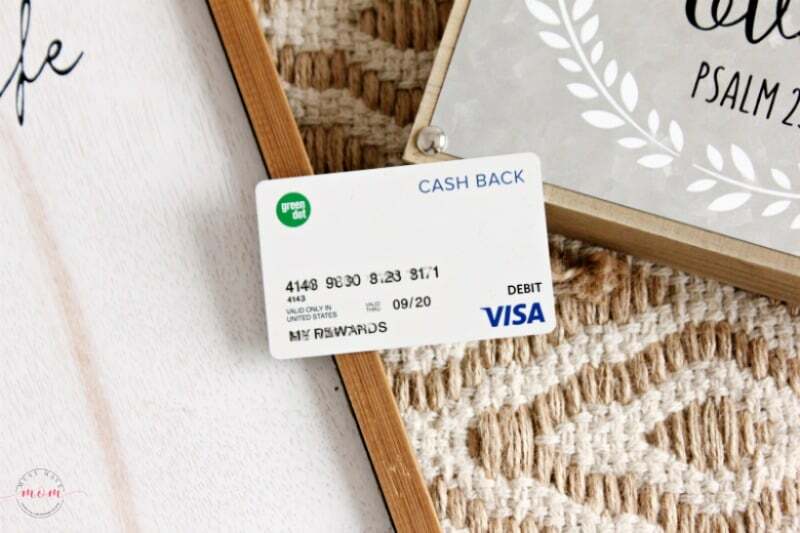 The Green Dot Bank Cash Back Visa Debit Card also offers cash back. I earn 5% cash back on every qualifying purchase, up to $100 a year. Do you know how far $100 a year can go towards farmhouse decor? Green Dot also offers a mobile app so I can stay current on my purchases and balance anytime I need to. I just simply load up my card when I have the money, then use it to stay on budget for my project. All while earning 5% cash back for buying things I would have purchased anyway. It really is a great way to stay on budget for anything you want. 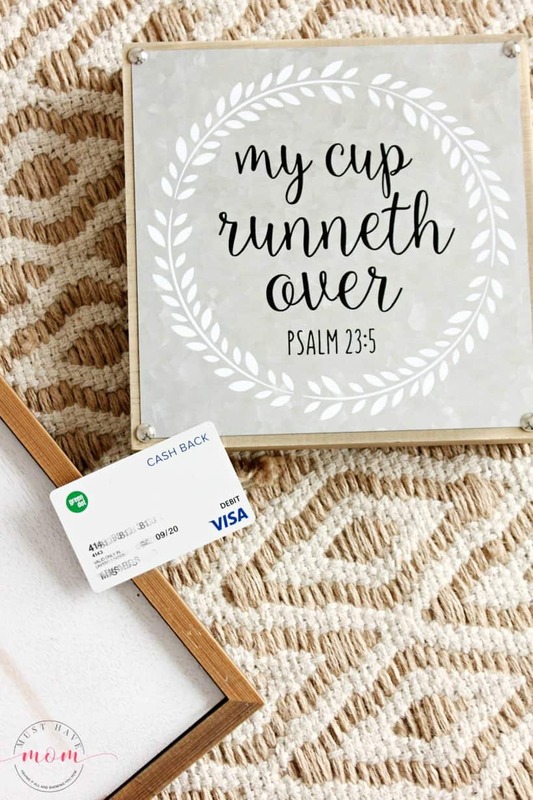 Now I’m off to shop for some new farmhouse, living room decor pieces using my Green Dot Bank Cash Back Visa Debit Card. Bank Smart. Get Rewarded. Get a Green Dot card today! Where Do I Get Farmhouse Style Ideas? 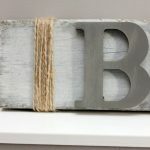 I just started a brand-new Facebook group where we can come together and share our farmhouse style ideas and DIY projects. Come join the conversation and inspire or be inspired! Join my farmhouse style facebook group! *Cards issued by Green Dot Bank, Member FDIC, pursuant to a license from Visa U.S.A. Inc.
1 Other fees and limits apply. 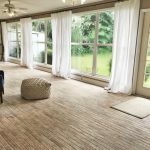 Farmhouse Style Cheap Curtains! DIY No Sew Curtains For $5! OMG that’s gorgeous! 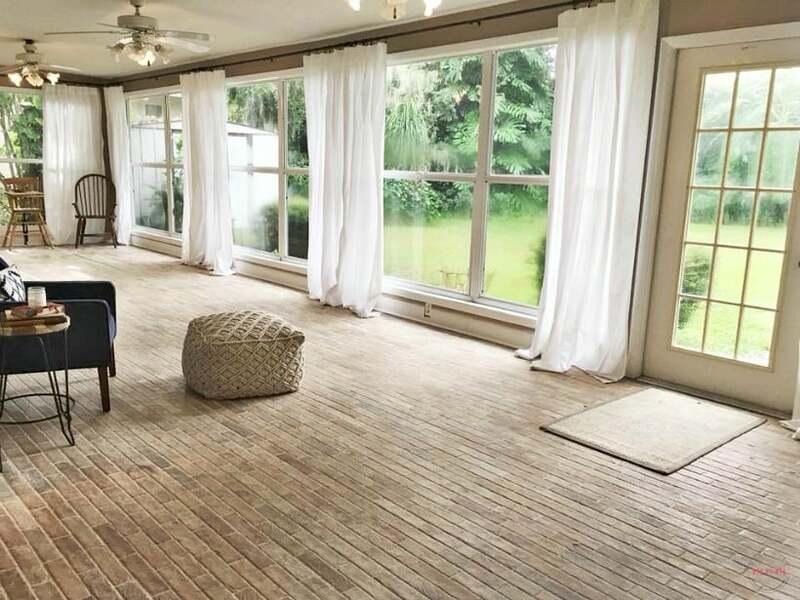 The bathroom….the windows…the flooring. Be still my heart! Awe thanks for the sweet words Jeni! I am a real lover of that farmhouse style. I have an older house and have a lot of the authentic pieces still here its not farmhouse but still has charm. I will look into that Visa card it sounds helpful. The farmhouse style is a cute look. I really do like the rustic look of it all. I could spend hours in antique stores. I love the makeover you did in your bathroom. I’ll have to look back at your other makeovers. It is so easy to go over budget. I love everything farmhouse style! Love the way you’ve styled everything! Sounds like a great way to stay on budget! I like these kinds of looks, especially when there is a lot of natural light in the house. I think I’d consider it for a living room or family room. Beautiful! My bedroom need a makeover. I may have to think about a farmhouse makeover. My dream is to have a farm house style house! This looks so dreamy and I cannot believe this was all done on a budget! 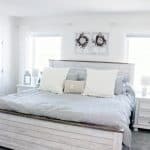 I love farmhouse style and I would love that bedroom!!!! The farmhouse style is amazing! I really like the rustic look and the light colors! I could spend hours shopping for this look at local stores! I can be hard to do a makeover on a budget, but you have offered great tips. I like how you can set aside a certain amount so you don’t over spend. Ive always love the farmhouse style. I love your budget tips as well!